This talk, by Dr. Alyssa Mt. 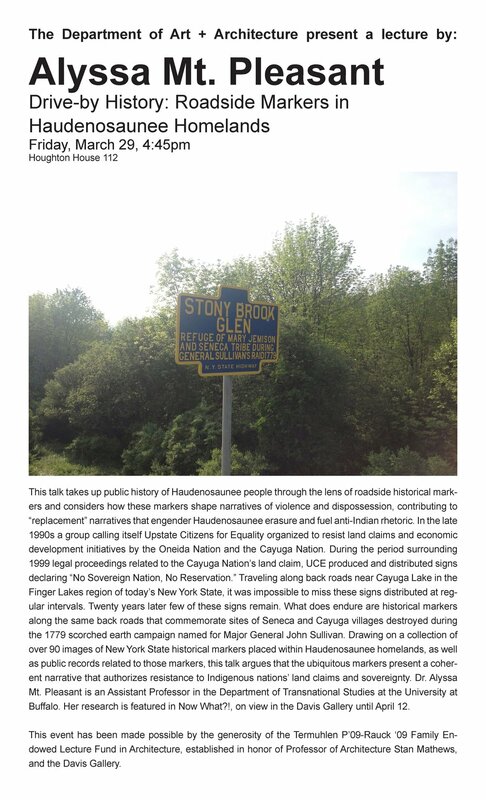 Pleasant, Assistant Professor in the Department of Transnational Studies at the University of Buffalo takes up public history of Haudenosaunee people through the lens of roadside historical mark-ers and considers how these markers shape narratives of violence and dispossession, contributing to “replacement” narratives that engender Haudenosaunee erasure and fuel anti-Indian rhetoric. Join Now What?! curators, Lori Brown, Andrea Merrett, Sarah Rafson, Roberta Washington in conversation with Annmarie Adams and Alanna Thain of McGill University for a lecture as part of the Democracy, Space, and Technology Lecture Series from the Yan P. Lin Centre. Architects and designers envision new futures while struggling in a present rife with oppression, discrimination, and injustice. How can we transform architecture and design so that how we work and what we design lead to a future of greater peace, justice, and liberation? The strongest force known to challenge systemic oppression is organized collective action -- come join a discussion with leading Bay Area organizations working to transform the architecture and design professions into forces of social progress! Join OWA members from across the years at a reception to entertain the question "Now What?!" surrounded by the context of the history of activist organizations. Now What?! Asks how to put activist values into design practice. Join us in the gallery for a practitioners’ roundtable moderated by our SF liaison, Sandra Vivanco, for a discussion of the challenges and inspiration of aligning work with social and political values. Leading up to the opening of Now What?! in San Francisco at the end of November, curator Lori Brown will present on ArchiteXX and her experiences in the architecture with a particular focus on gender and social justice issues. MiXX is a monthly networking and socializing opportunity, in conjunction with our Women in Architecture and Planning MeetUp Group, where everyone is welcome! We welcome members of allied organizations from around the city to join us and raise a glass. Please visit MeetUp or Eventbrite to sign up. The ArchiteXX Reading Group meets the second Tuesday of the month to facilitate discussion on women in architecture and urban planning through a variety of critical reading materials. Butler, Judith. “Bodily Inscription, Performative Subversions,” Gender Trouble. New York: Routledge, 1999. 163-180. Retter, Yolanda, Anne-Marie Bouthillette, Gordon Brent Ingram, Eds. Queers in Space: Communities, Public Places, Sites of Resistance. Bay Press, 1997. “Lost in Space: Queer Theory and Community Activism at the Fin-de-Millénaire.” 2-15; “Making Room: Queerscape Architectures and the Spaces of Activism.” 1-8. On the weekend of the AIA National Convention in New York City, the Lobby will engage with neglected issues that fundamentally determine the direction of our discipline. This Think-In is divided into two parts over two days: active engagement with relevant sessions at the AIA National convention to ensure substantive dialogues on professional issues on Friday, June 22; and Think-In panel discussions on Saturday, June 23 at Prime Produce that examine the theme of Infrastructure. Infrastructure is the network of systems necessary for an organization to function. When those systems are degraded enough, the defining functions of the organization fail. The Architecture Lobby has selected this theme for its first National Think-In to generate a way forward and rebuild our discipline’s infrastructure. Full line-up will be announced soon. It will include Now What?! curator Andrea J. Merrett. Super-tall luxury towers are the latest installation in the ongoing story of NY’s hot real-estate market…yet they threaten to rapidly gentrify their surroundings and displace long-time residents and businesses. Join members of the Collective for Community, Culture, and Environment and other design and planning professionals to explore how community-led planning and policy development, urban design, legal and organizing strategies can shape the fight against rapid gentrification, segregation, and displacement – and offer beautiful, sustainable and equitable alternatives. The panelists will share perspectives and proposals on the creation/preservation of affordability in NYC's hot markets – and how this could impact community planning nation-wide. The panel discussion will be held at Pratt’s Higgins Hall in Brooklyn, designed by architect Steven Holl. Join us at the exhibition Now What?! 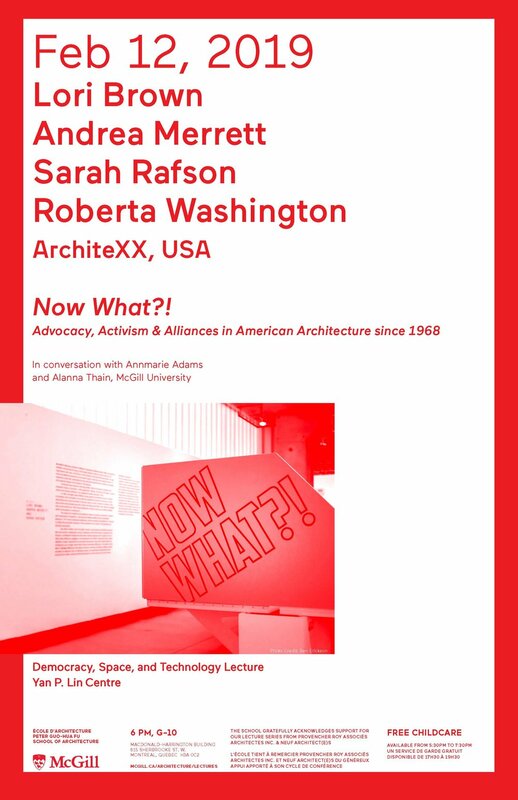 Advocacy, Activism & Alliances in American Architecture since 1968, located at Pratt Institute, by writing a Wikipedia entry for at least one woman architect, designer, or activist. ArchiteXX, Pratt School of Design, and Wikimedia NYC would like to invite everyone to help write Wikipedia entries for designers, architects, and activists from marginalized groups during this critical exhibition. This event is part of our global efforts to write in a diverse representation of women, which we have been coordinating with Parlour (Australia) and n-ails (Berlin). Our #WikiD guides to editing Wikipedia are available here to help you. Join Ronald Shiffman, Pratt Professor Emeritus and founder of the Pratt Institute Center for Community and Environmental Development (PICCED), and emerging activist designers in conversation on urban equity work in New York, 1963 to today. Responding to the Now What?! exhibition, speakers will present their design activism projects, addressing what it takes to move from planning to implementation. Prof. Shiffman will tell the story of the formation of PICCED and how the group’s strategies have supported local communities for over 50 years. Francisca Benítez will speak about anti-displacement struggles in Chinatown and the Lower East Side and about why the city should adopt the Chinatown Working Group plan; Ifeoma Ebo will share her design and community engagement work with the Mayor’s Office of Criminal Justice; and Maria de la Torre will show the latest project of Hester Street. We will discuss the work of women and non-binary leaders not only in design but also in the communities with whom we collaborate. Opening night reception with wine, donuts by Dough, and a gallery talk presentations by exhibition curators, Lori Brown, Andrea Merrett, Sarah Rafson, and Roberta Washington.